Moon / December 5, 2016 / L.A.
Buy a copper pitcher or get a bottle like the one I got. I think you need to get one with a lid. Clean it once you get it of course (see below). Fill your container with the water of your choice. I don’t think that the water temperature matters, what matters is that you let it sit at room temperature for at least 4 hours, but preferably overnight. Next, drink. Don’t refrigerate the water. Quick note: I only drink room temperature water, it’s better for the body. If you are continually using your bottle and keeping it clean it should be pretty low maintenance, it’s just water. Should you need to clean it, hand-wash only. I used fresh lemon and water and also rinsed it with some white vinegar. Make sure you dry thoroughly, but don’t freak out about tarnishing. I assume it’s going to happen and I couldn’t find anything that says that it’s bad for you. I read that tarnishing can be fixed by using a concentrated lemon juice (3 cups), salt (1 cup), and white vinegar solution. Do not run in the dishwasher. Tamba(Copper) water is beneficial for all body parts. 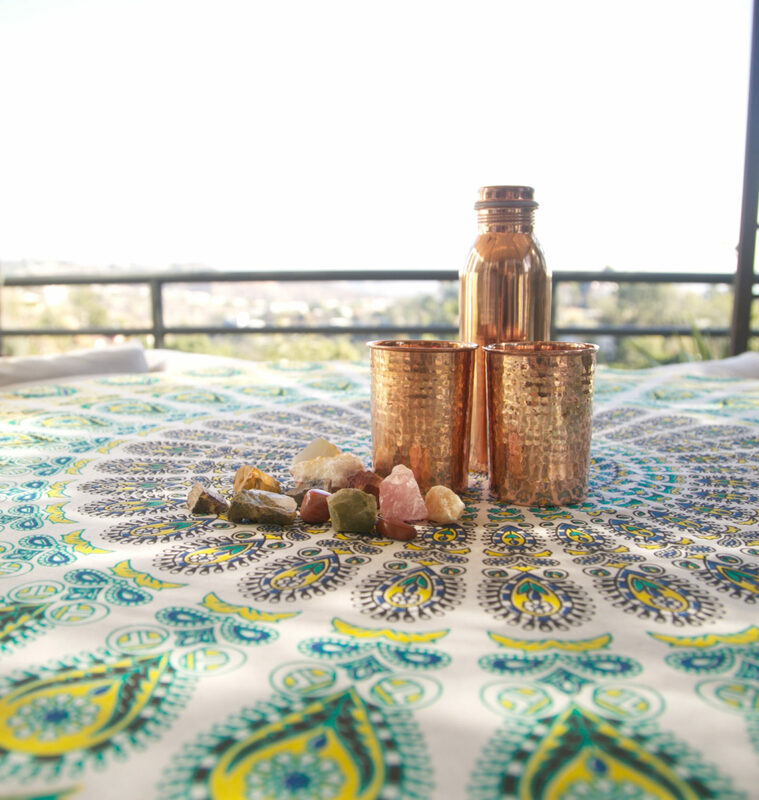 Ayurvedic treatments use meditation, yoga, herbs and other things such as the (copper)Tamba Cup, Tamba Bottle to help reestablish balance. I am not an old man, but not a young man either. I have been dancing with systemic arthritis for years. In a box, tucked away, I stumbled upon my grandfather’s old copper bracelet which I have been wearing for several months now. Whether it is legitimate absorption, or the “Dumbo feather” effect, my arthritis has calmed down considerably. Quite fashionable as well! Copper drinking vessel is the next level on my path. Thanks again for sharing your insight, inspiration and beauty. Bookmarking this post as I am definitely trying to get a bit healthier. Awesome insights.